Since my last posting, I have been to the eye doctor and she told me my eyes are the same as last year and I am good for another year. That is good news since my eyes are as important to me for stitching and computing too. I have been stitching in my spare time, of which sometimes I think I have precious little. But every day I try to do a little bit, it keeps my sanity. I am working on several things, some are further along than others and some are still in the “mulling over in my mind” stage. One is a small piece, shamrocks with a pink bow, my friend Joan Lewis painted for me several years ago. Joan and I worked together at Two the Point for years and now she has a website with many of her original designs (http://www.joansneedlepoint.com/index.htm ) She’s another one of the talented inspirations in my life. I started the background with one of my favorite stitches, the Woven or T-stitch (just depends on whose book you are using.) I like this stitch as a background stitch; it seems to recede and remain in the background when with a thread that is the same color and the size of the thread is smaller or equal to the canvas thread size. This stitch can be worked two ways: diagonally, which I prefer, but then I like any stitch that can be stitched diagonally…I think it helps reduce the distortion of the canvas, or the stitch may be executed in rows. Notice the pink and blue on the diagrams…these are the stitch on the back of the canvas and they influence the look of the stitch on the front of the canvas. The difference is not noticeable when using a thread that is the same or similar to the painted portion of the canvas or the canvas color. Where it would make a difference is when the stitch is executed in rows and the thread is a contrasting color or even a different value of color; remember color effects color! The diagonal method of stitching seems to hide the back part of the thread behind the canvas threads more but a contrast of color or value change will affect the stitch appearance, but maybe not as dramatically as the row method of stitching. I soon realized I was going to need a place other than the outside border to begin, end threads and turn for new row; so I stopped the Woven stitch and stitched the shamrocks. 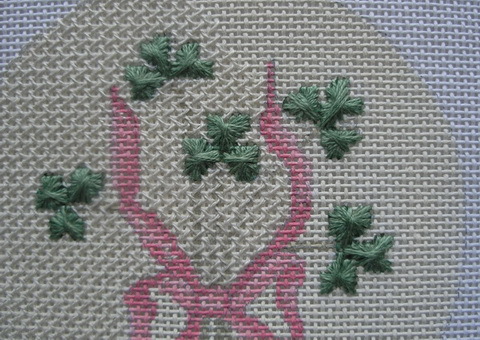 Each shamrock petal is stitched in a Rhodes stitch adapted to fill the petal area. I first decided the outlines of each petal (segments) and the order to stitch (could determine which petal appears to be in front of another petal.) 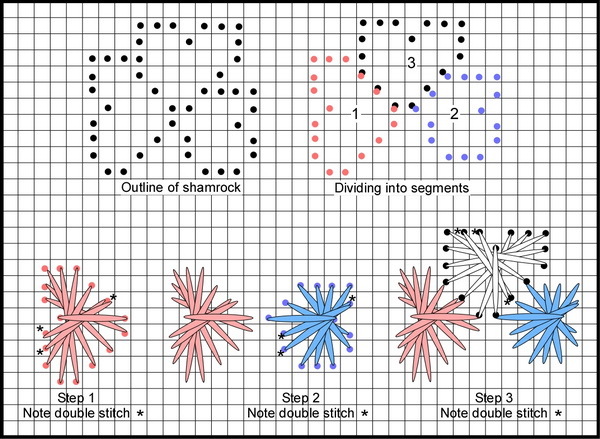 Notice that the petals diagramed here have double stitches (two stitches using the same space); not all petals will have these but some may. When I was deciding the order to stitch each petal, the only rule I made for myself was that the last stitch (top stitch) should be as close to the center stitch as possible. As I was diagraming this stitch I noticed a place where I could stitch differently (petal 1) or were I might need an extra stitch to fill the area (petal 2 & 3). The second diagram shows how these would look if I made these changes (I didn’t think petal 2 would looked better or worse.) 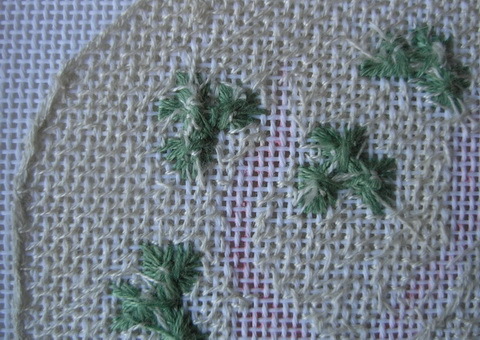 Each shamrock was stitched using this method and so no two shamrocks are alike ( oh just like nature). I am also showing you the back of my canvas so you can see how I used the shamrocks as turn around and places to bury background thread. I have a friend who says that if you are close enough to her work to see her mistakes you are too close. And you should never look at the back of a stitchers work unless she offers to let you see it and never ever make a comment about the condition of the back…this stitcher has allowed you a glimpse into her most sacred self… Please be kind. Never fear I have something else to stitch while I do this!